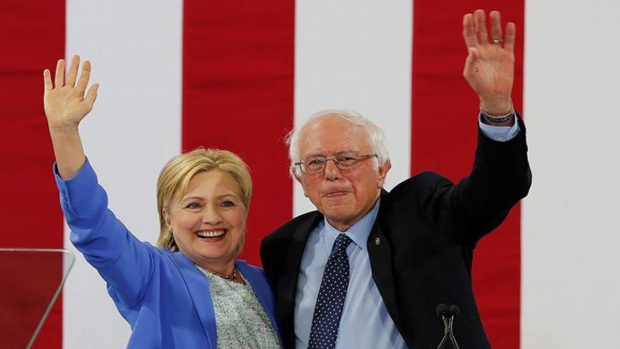 Appealing to elusive young voters, Hillary Clinton turned to former primary adversary Bernie Sanders on Wednesday to connect with millennials drawn to third-party candidates threatening to act as spoilers in the 2016 campaign. "None of this will happen if you don't turn out and vote," Clinton said on stage at the University of New Hampshire while flanked by Sanders, who overwhelmed her in the state's first-in-the-nation primary nine months ago. 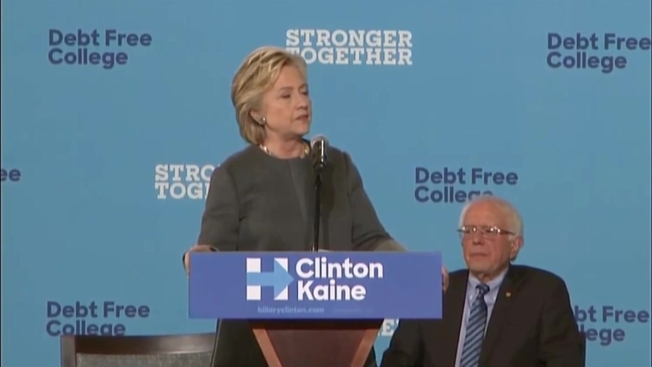 Both Clinton and Sanders touted a plan they developed at the end of the primaries to make college debt-free for millions of students from middle-class and low-income families. Amid signs promoting the proposal, Clinton promised to push the plan through Congress if elected. The former opponents sat on stage for a panel discussion on ways to make college more affordable in the battleground state. 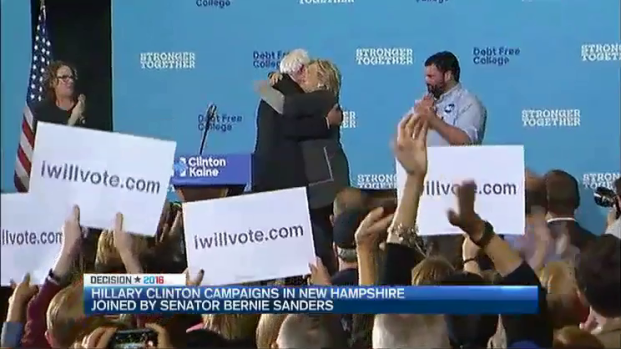 "I am here today to ask you not only to vote for Secretary Clinton but to work hard," said Sanders, who exchanged a brief hug with Clinton after she took the stage. "It is imperative that we elect Hillary Clinton as our next president." Democratic presidential nominee Hillary Clinton spoke to voters at a rally in Portsmouth, New Hampshire, on Wednesday with Bernie Sanders. Young voters were a key part of President Barack Obama's winning coalition, with two-thirds of voters under 30 backing him in 2008 and 60 percent four years later, according to exit polls. That same group fueled Sanders' insurgent bid, keeping him in the race until the final primary contest concluded in June. But while millennials have recoiled from Donald Trump, they haven't flocked to Clinton, who's not only shy of Obama's mark but also well behind John Kerry's level of support with young voters when he lost in 2004. Particularly concerning to the Clinton campaign is the numbers of young voters — nearly a fifth, according to polls — drifting to the Libertarian nominee, Gary Johnson, and Green Party candidate Jill Stein. Clinton's team worries that if those third-party candidates continue to draw significant support from Clinton, it would lower the margin Trump needs to win the White House. An Associated Press-GfK poll conducted earlier this month found that 48 percent of likely voters under 30 backed Clinton, 27 percent were for Trump, 14 percent for Johnson and 3 percent for Stein. "Millennials, who were a huge part of the Obama coalition and a huge part of the future, are genuinely at risk in terms of support and turnout," said Democratic pollster Stan Greenberg. Clinton acknowledges that she's struggled to convince millennials, who came of age during the politically polarized Obama era, an experience that's left them more skeptical of political party politics. Hillary Clinton and Bernie Sanders will be taking on the issue of student debt. Her campaign is trying to reach those voters where they live — online. They're planning online videos, interviews with streaming television shows and social media messages. Already, she's appeared on singer Mary J. Blige's Apple Music show and actor Zack Galifianakis' online sketch comedy. But Sanders might be one of Clinton's best assets to bring the younger siblings of those Obama voters into the Democratic fold. As he's campaigned across the country, the longtime independent politician has become a critic of third-party candidates, warning voters that it's not the year for a protest vote. That's a message Sanders plans to take into at least a dozen battleground states before Election Day, according to aides, who say Sanders will be campaigning continuously over the next five weeks for Clinton. Becoming a Clinton backer hasn't been easy for Sanders. His supporters jeered at mentions of Clinton's name during the party's national convention in July. And he remains undecided whether to leverage his sizable supporter email list on Clinton's behalf, according to an aide. In New Hampshire, a state with a politically independent streak that worries some Clinton aides, Sanders tucked his support into a speech that focused on many of the themes of his primary campaign like combating money in politics. "Is everybody here ready to transform America?" he asked the cheering crowd. "Today I am asking all of you to think big, not small." Did Lester Holt give Hillary a break, by not asking about Clinton Foundation, Benghazi - while grilling Donald on birtherism and his taxes? What comments are most likely to be turned into TV ads? 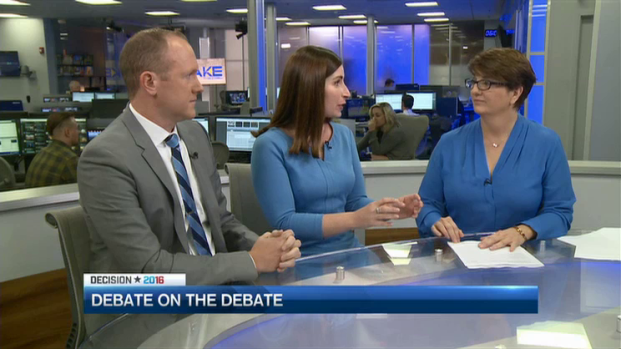 Sue's guests are Democratic analyst Jesse Mermell and Republican analyst Jeff Semon.